​Thank you for your interest in joining our global network of dedicated volunteers. With your help, we can make an even greater difference in communities around the world. By completing the information below, you will be taking the first step to becoming a member. We will use this information to connect you with our local club liaison to assess your inquiry. Membership is not guaranteed and each club holds the right to make their own membership decisions. 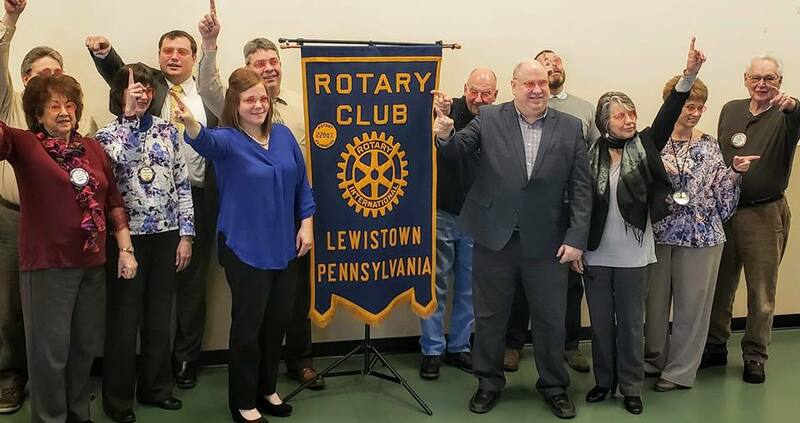 By selecting "submit," you agree that Rotary Club of Lewistown may process your personal information. The personal information you provide will be shared with Rotary club and district officers and their delegates. It also may be used to invite you to participate in other membership opportunities, program evaluations and surveys, and Rotary events, as well as for membership data reporting purposes. The second original reason for Rotary's beginning is business development. Everyone needs to network. Rotary consists of a cross¬section of every business community. Its members come from all walks of life. Rotarians help each other and collectively help others. Membership in Rotary ensures continuing growthand education in human relations and personal development. Rotary is an organization of leaders and successful people. Serving in Rotary positions is like a college education. Leadership is all about learning how to motivate, influence and lead leaders. Membership in a Rotary club helps develop better community citizens. The average Rotary club consists of the most active citizens of any community. Each week at Rotary, there is a program designed to keep members informed about what is going on in the community, nation and world. Each meeting provides an opportunity to listen to different speakers on a variety of timely topics. Rotary is a fun and exciting place to be. professionals - people who make decisions and influence policy. Every Rotarian wears a pin that says "Rotary International." There are few places on the globe that do not have a Rotary club. Every Rotarian is welcome - even encouraged - to attend any of the 30,000 clubs in 194 nations and geographical regions. This encourages new friendships in both local and world communities. Traveling Rotarians can secure medical and professional assistance as well as services and advice from fellow Rotarians throughout the world. Many individuals who joined Rotary were uncomfortable about speaking in public. Rotary develops confidence and skill in public communication and the opportunity to practice and perfect these skills. Every Rotary club and district has parties and activities that contribute to a diverse, yet professional business life. Rotary holds conferences, conventions, assemblies, and institutes that provide entertainment in addition to Rotary information, education, and service. Rotary provides one of the world's largest youth exchange programs; high school and college clubs for future Rotarians; opportunities for spouse involvement; and a host of activities designed to help family members in growth and the development of family values. Every Rotarian is expected to take part in the growth and development of his or her own profession or vocation; to serve on committees and to teach youth about jobs or vocations. Rotary helps to make each individual a better doctor, lawyer, teacher, etc. ethical standards. Rotarians are expected to be ethical in business and personal relationships. Around the world, practically every religion, country, culture, race, creed, political persuasion, language, color and ethnic identity is represented among members of Rotary. Rotary is a cross section of the world's most prominent citizens who are aware of their cultures and have developed a love of working with people everywhere. They become better citizens of their countries in the process. Rotarians are the nicest people on the face of the earth. 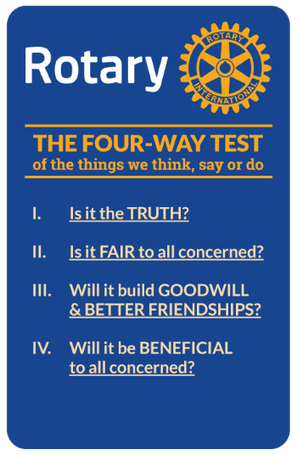 Rotary has no secret handshake, no official creed, no secret meetings or rituals. It is an open society of men and women who simply believe in helping others. As a service club, Rotary's business is mankind and its product is service. This is perhaps the best reason for becoming a Rotarian: the chance to do good.